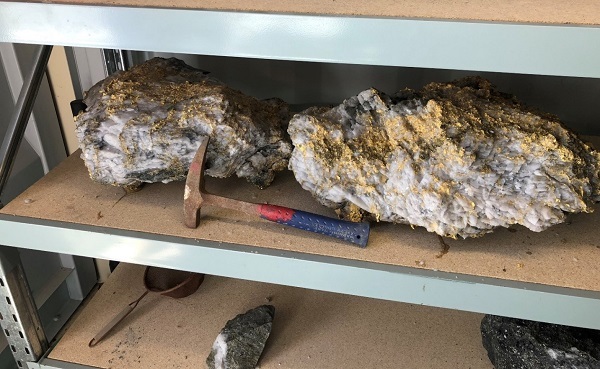 Workers at an Australian mine were amazed after discovering a rare gold vein containing two giant quartz rocks encrusted in gold, with an estimated value between $6 million and $10 million for the pair. The two rocks, pictured below, were discovered 500 metres underground. They weigh 95kg and 63kg respectively, with initial valuations of the rocks and their gold being $4 million and $2.6 million apiece. Given the rarity of such a find though, the owners of the mine believe they could be looking at anything up to $10 million for their find. Photo courtesy of RNC Minerals. Airleg driller Henry Dole is accredited with the discovery. The veteran miner of 16 years told ABC News: “Everything was covered in dust, and as I watered the dirt down there was just gold everywhere, as far as you could see”. The Beta Hunt Mine is located near the tiny settlement of Kambalda, deep into the Goldfields-Esperance region of Western Australia – a modest 391.5 miles away from Perth on the west coast. Canadian firm RNC Minerals runs the nickel mine and noticed traces of gold from digs back in June. Using surveying techniques, geologists identified where they believed gold was likely to be, and the miners got to work. According to RNC’s press release, approximately 9,250 ounces of high-grade gold was produced from the gold vein, which itself was roughly a 44 metres cubed cut into the ground. This dig produced 130 tonnes of earth, meaning the gold per tonne was 2,200 grams. Put into context, gold per tonne is usually around 2 grams. Geologist Zaf Thanos told Australia’s ABC News this was a “once-in-a-lifetime discovery”, while Professor Sam Spearing, Director of the Western Australia School of Mines at Curtin University, called it “exceedingly rare and very exciting” when interviewed by the BBC. RNC Minerals are currently in the latter stages of selling the mine, having near-exhausted the site for nickel but lacking the capital needed to fund further exploration and digging for gold. While this discovery is a huge boost for the company’s potential funds, the deal is still expected to go ahead. For more technical information about the gold discovery you can view the RNC Minerals press release.